Ok, you want to make a new kitchen or renew your old one?! The biggest problem of all is the space. It is never enough, no matter how big your kitchen is. Sink, dishwasher, oven, stove, storage places and so on - all of this must fit in the kitchen. And if possible, let all of this looks good together, creating a wonderful and bright kitchen interior. All of this sounds familiar?! Look at this All-on-one Cook 'n' Roll. 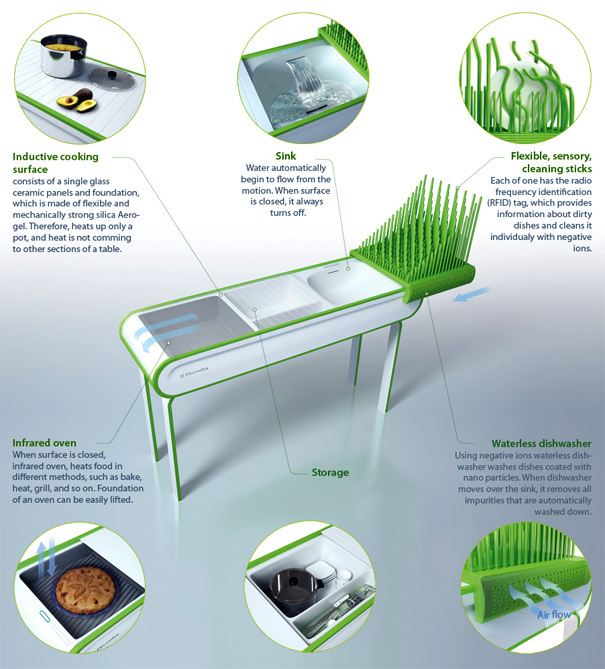 The designer Zivile Januskaityte simply called it concept kitchen table. This super compact tool includes all the equipment you need for food preparation and cleaning - storage, sink, oven, cook top, dishwasher and sanitizer. The sink is covered by sliding top, which is inductive and can be used as a stove. The sink has a very nice design, although I don't see where water comes from without plumbing but it is touch controlled. Next to the sink is sanitizer, which uses negative ions to clean the dirty dishes. On the other side of the sink is the storage area and after that - an infrared oven. This works only when is covered with the top for safety reasons. The oven can bake, heat, grill and so on. This is basically a concept. We were not able to find a company that actually produces this but let's hope this will come true in the near future. Especially those of us with small kitchens.